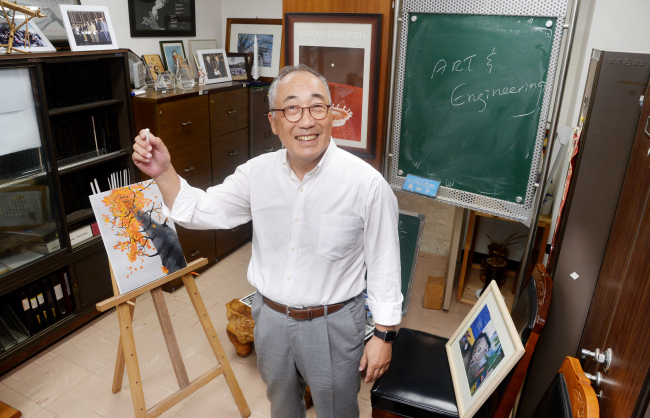 DAEJEON – Although he has not taught classes in the spring semester, the office of KAIST professor emeritus Kim Yang-han looks busy, books stacked on the desks. He was reading about how Friedrich Nietzsche’s use of a typewriter changed his writing style when I arrive for the interview on June 7. The German philosopher’s switch from writing longhand to using typewriter profoundly influenced how he wrote, says Kim. Kim is preparing for his class next semester where he will teach about the relationship between art and mechanical engineering. “I decided to change the course title to ‘Picasso’s Engineering School,’” Kim says. This sounds a lot more intriguing than “Learning mechanical engineering through Western art,” as was initially suggested. Kim is what many would typically call an “elite.” He graduated from a prestigious high school in Seoul, studied mechanical engineering at Seoul National University and went onto MIT on a highly competitive state scholarship. At MIT, he specialized in acoustical engineering and received his doctoral degree in 1985. While many of his peers at the time chose to remain in the US upon graduation, Kim returned to Korea to join the KAIST faculty. He had interviewed for a position at a university in Rhode Island and that evening he called KAIST to accept its offer. “The interview went well. There was an informal gathering of professors in the evening and it was then that I realized that I did not belong,” he says. He has been at KAIST ever since. He is Korea’s leading expert in acoustical engineering and has developed Virtual Sound Ball, a 3-D effects technology which stays near a listener at multiple angles. He has also invented a “spatial equalizer” that allows devices to control the sound ball. What prompted the engineer’s interest in art? A professor of mechanical engineering teaching that has anything to do with art, after all, is not common. “It was in 1987 and I had arrived early for an academic conference in Amsterdam. So I happened to visit the Van Gogh Museum,” he says. What was an unplanned, casual visit held an epiphany for Kim. “I was surprised. Van Gogh made numerous sketches. I felt he must have studied, practiced a lot. It inspired me to focus even more on the basics,” he says. From then on, he began looking at art with greater attention. Oblivious to the numerous art institutions of Boston while a graduate student at MIT, his eyes were now open to the rich cultural offerings of the city. Whenever he attended conferences, he made sure to visit the cities’ museums. “About 10 years ago, on a visit to Penn State University, I made a stop in New York to see the New York Metropolitan Museum of Art. I went there for three straight days,” he says. Once again, he was struck by the Van Gogh pieces. Observing the paintings closely, he saw the dynamic brush strokes. On a trip to Zimbabwe, he was introduced to Shona stone sculptures. He still remembers the local artists telling him, “The sculpture is already there in the stone.” Once he had seen Shona sculptures, he was able to see the Shona influence in Picasso’s works. “Picasso, like Shakespeare, copied and appropriated,” Kim observes. Kim is much in demand as a speaker and his calendar is filled with lecture engagements where he is asked to talk about art and engineering. He began lecturing on a similar theme about two years ago. Kim suggests his lectures are popular because they deal with the meeting of two different concepts -- Western art and mechanical engineering. Knowing that the best way to learn is to teach, he proposed the class combining art and engineering for the upcoming fall semester. “Why am I doing this class? What motivates engineers today is very different from my time,” he says. In the 1970s and 1980s, there was a national drive to promote industries and export and the highest caliber students went into engineering. “There was a strong social message that we must study engineering. It was ingrained in me that since the country lacked natural resources, we needed to make good products to export,” he says. Kim expressed disappointment with engineering students of today. “High caliber students do not go into engineering because there is no future in engineering. If you join major conglomerates, you retire at 50. Starting your own venture company is hard. There is a crisis in engineering,” he says. As for Kim, he finds engineering studies very interesting. “It is a creative job,” he says, pointing out that mechanical engineering is about creating something that people need. “It is a creative process, very similar to painting,” he says. In both fields, you need to study, practice, study other examples and that is how you arrive at a design imbued with your own original thinking, he explains. He cited the example of Flemish painter Rubens as an artist who did a lot of collaborative work with other artists. In Paik Nam-june, the late Korean video artist, he sees an artist rebelling against TV, while at the same time expressing the new human with TV art. “Technical innovations result from seeking ways to break away from limitations,” he says. “My message is you can be a Van Gogh, a Picasso. Steve Jobs was similar to Van Gogh and Picasso,” Kim says, reiterating that creative thinking arises from close observation and continued practice. “My audience, who are mostly engineers, are receptive to this message. I want to give a message of hope to young people,” he says. A piano sits in the lobby of the engineering department building which is free for anyone to play. A mini concert is held Fridays. It was Kim’s idea to have a piano in the lobby, he says, an effort to bring the arts closer to engineers. “To do something creative requires an understanding of people, and understanding people requires an understanding of art,” he emphasizes.